[Reno, Nevada, USA] – One of the stereotypes of ballet is that it’s a girl’s activity. Often when one thinks of a ballet dancer, a woman wearing a tutu and pirouetting with her pointe shoes is the first thing that pops into your head. The concept of a male ballet dancer is not top of mind — especially in the United States. Yet some of the most famous ballet dancers of all time are men. With their powerful leaps, dancers Mikhail Baryshnikov and Rudolf Nureyev are arguably the two most well-known dancers in modern ballet. 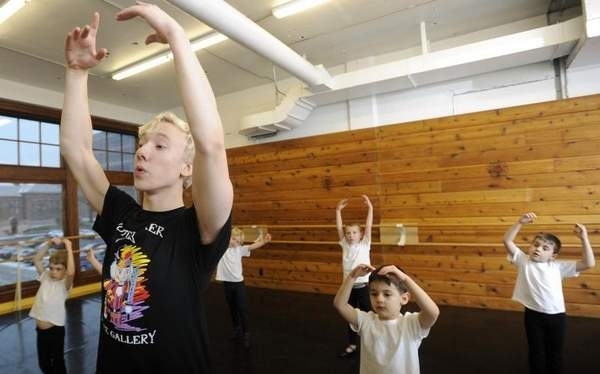 There has been a stigma in the U.S. that has kept American boys away from ballet. It’s kind of ironic because when you watch a professional ballet dancer, both male and female, the athleticism is as rigorous as in any sport. And I mean any sport. The leg strength needed to make those commanding leaps and the upper body strength required for partnering and lifting a ballerina into the air is substantial. What they make look so easy is tremendously difficult to do. The lack of male dancers from the U.S. means a majority of male dancers in American ballet companies come from other countries. There have been periods of time where all of the male dancers in the San Francisco Ballet have been from countries outside of the United States. Perhaps this is beginning to change. The success of the stage play and the movie “Billy Elliot,” the popularity of the television show “So You Think You Can Dance,” and the growing approval of ballet in general are adding an element of cool to the art form. Raymond Tilton has danced with the San Francisco Ballet and is currently with the Diablo Ballet. Raymond will be making his debut with A.V.A. 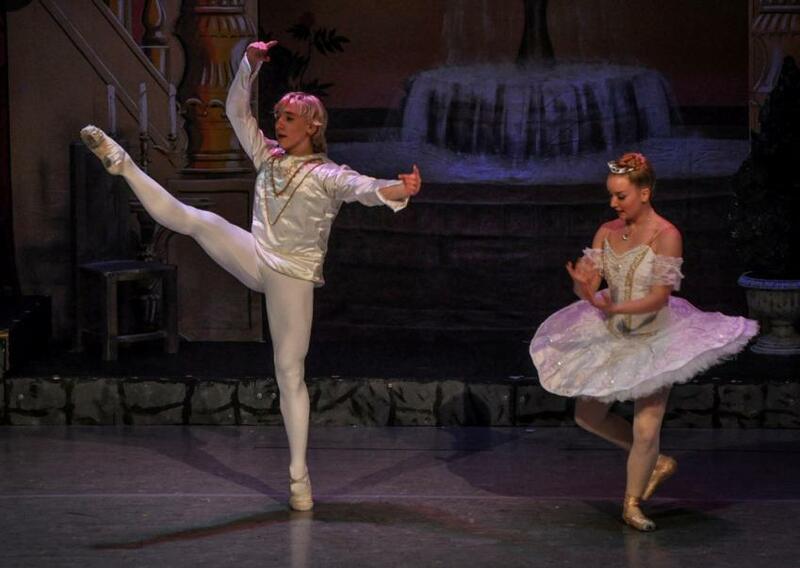 Ballet Theatre next week in “The Nutcracker” at the Pioneer Center for the Performing Arts. He will star as the Sugar Plum Cavalier. I asked Raymond how the four brothers became involved with ballet. “Our sisters were taking ballet lessons,” he said of his older sister Alexis and twin younger sisters Angelica and Abigale. “My brothers and I were outside of their ballet studio just goofing around. The director of the studio — needing male dancers for his performances — came out and offered us free dance lessons.” At the time, none of the brothers expected that ballet would become such a large part of their lives. Their passion had been soccer. They each began attending more advanced ballet schools and honing their skills. While the oldest brother Roy has moved on to other pursuits, Rex, Ronald and Raymond continue to excel in the profession. Their dark hair and handsome brooding features combined with their dancing ability make them popular performers. Joining Raymond in the production will be local male dancer David Huffmire. David has danced with A.V.A. Ballet Theatre since he was a child and is currently a trainee with Ballet West. David was so eager to begin professional dancing in Utah that he graduated early from Galena High School to make this happen. Like the Tilton brothers, David knows it’s cool to be a ballet dancer. Steve Trounday is a board member at A.V.A. Ballet Theatre, the resident ballet company of the Pioneer Center. [Leeds, West Yorkshire, England] – Northern Ballet Academy is looking for new recruits. And it’s not the boys who are in short supply. It’s 4pm on a Thursday evening and with school over, it’s a fair bet that most teenage boys have already swapped the classroom for the computer. Not Ben Davis. As he is most days, the 15 year old is warming up in one of the studios in Northern Ballet’s Quarry Hill headquarters. He won’t get home for at least another few hours when he will then have to catch up with homework and sleep. Call it the Billy Elliot effect or the impact of choreographers like Matthew Bourne, who famously staged the first all-male Swan Lake, but in recent years Northern Ballet has had little difficulty finding talented male dancers, who now make up close to 50 per cent of those who graduate from its Academy. Like many, Ben was spotted by Yoko Ichino, associate director of the Academy and wife of the company’s artistic director David Nixon. Together they make a pretty formidable partnership and have helped put the company on the national and international dance map. It was David who spearheaded Northern Ballet’s move from its old, rather dilapidated base on the outskirts of the city and into the largest purpose-built dance studios and theatre outside London. Now rubbing shoulders with West Yorkshire Playhouse, Leeds College of Music and Yorkshire Dance, it gave the company the surroundings to match its ambitions and brought it into the heart of the city. It’s those same connections that the Academy wants to foster which is why it’s holding an open day next weekend [ September 12-13th 2015] in the hope of sparking the interest of others like Ben. Spotting and nurturing the talent of the future has always been one of Northern Ballet’s priority, but in the last few years it has been able to increase its national and international reputation for training. Nixon says that while some centres are desperate for their dancers to hit certain milestones by certain ages, Yoko insists that everyone who comes through the Academy system is trained as an individual. 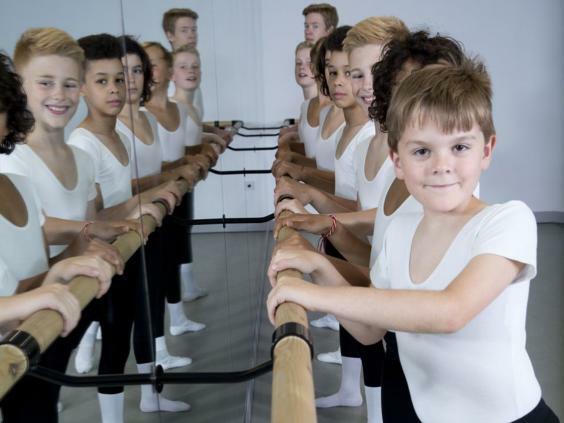 While many of the Academy recruits come from local dance schools, Northern Ballet also tries to find untapped talent from within Leeds and the surrounding the area. “There are many children who don’t have the opportunity to have dance lessons and so we now run a programme where we go into schools and try to reach those who have never event attempted an arabesque,” adds David. “That’s great for us as we get to see them before they have had a chance to learn any bad habits. Those that we feel have potential are then invited to workshops. That’s as much for them to see what we do and how we work and the scheme has proved incredibly successful. “The world of ballet is often accused of being elitist, but we have always tried to appeal to as wider section of the community as possible. Dance as a whole has also become much more flexible. There is and always will be an ideal shape for a male and female dancer, but that’s not to say that anyone who doesn’t fit those statistics is automatically ruled out. [Sioux falls, South Dakota, USA] -Ever since Brennan Benson watched the tap scene from “The Music Man,” he knew he wanted to dance. He laced up his church shoes, snatched the lid off his toy box and started stomping away. Benson loves contemporary dance and jazz, but ballet is his passion and his strength. He currently teaches Dance Gallery’s Boys Club, a ballet class just for boys. Imagine a gallery overflowing with the energy of a dozen 5- to 7-year-olds clad in black pants and white T-shirts — leaping, turning and stretching at the barre and, at least once in a while, bouncing off the walls. That’s Boys Club, and it’s thriving. Benson presides over them all, gently reminding the boys how to stand, when to be quiet, how to move. They face the barre in first position. They face the mirrors and imitate their leader’s poise and elegant strength. Sure, there might be a few theatrical falls (there is a newspaper photographer in the room, after all), but Benson brings their focus back to center. Ballet is physically and mentally demanding, although, when you’re 7, it feels an awful lot like play. Still, the demands of dance are intense. Physicality. Artistry. Discipline. More boys than ever are being drawn to the foundational experience and the flourishing opportunities of ballet. 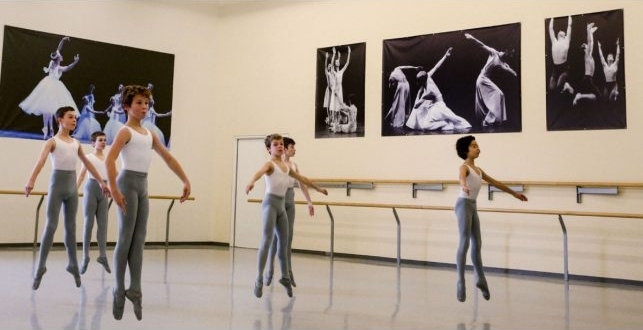 Last month, Canada’s National Ballet School reported its highest percentage in history of boys in its entry level class — 65 percent. Enrollment of boys at the school was the highest ever at 41 percent. Men in modern ballet are not token princes and lifters of the ladies. In fact, the students at Boys Club probably haven’t considered the possibility of partnering with the girls. The boys are just here to dance. And yet, Preston will spend the evening in motion, expressing far more physically than verbally. Watch and you can see joy and confidence, exuberance and exhaustion, restoration and contentment. Eliot Gongopoulos is 6 years old. His sister has studied at Dance Gallery for years, so Eliot is at the studio often. He learns hip-hop in a class that includes boys and girls, but in Boys Club, it’s just the guys. But Benson is determined to make a career in dance, and he’s well on his way. He has already been invited to become a member of the trainee program with Ballet West in Salt Lake City. Most of what Benson knows about ballet, he has learned from women, a common experience for male ballet dancers, at least in the early years. But he also has traveled across the country to study from male teachers. Every Dance Gallery teacher has become like another mother to him, Benson says. His dance family is “definitely a second family to me.” But it was his grandmother who truly saved his love of ballet after a violent incident nearly scuttled Benson’s dreams forever. Benson was good at the game, he was fit, and his athleticism did not go unnoticed. Frustration mounted, and one of the opposing players started to get angry. He slammed into Benson, shoving his street hockey broomstick into the base of the boy’s skull, knocking him unconscious. When Benson, then 13, woke up, he wasn’t sure what had happened. The concussion and recovery caused him to struggle physically and mentally. The boy who injured him has never apologized. What turned the tide was an article that Benson’s grandmother sent him about David Hallberg, a South Dakota native who went on to professional stardom. In 2011, Hallberg joined the Bolshoi Ballet as a principal danseur. He was the first American to join the company. And so Benson dances on. He holds principal roles in this year’s holiday performances of “The Nutcracker.” He teaches weekly. He plans his future. The oldest of eight children, Benson is home-schooled. He is used to working outside of conventional boxes and expectations. He is used to pushing himself to excel. A whole lot of boys have been privileged to watch him do so and have been shown that they can succeed as well. Don’t waste time, Benson says. If you have a boy who shows the “first glance of an interest” in dance, bring them to ballet. As for Benson, he won’t dance in Sioux Falls forever. Dancers of his talent must journey. He already belongs to a bigger club — young artists compelled to leave home, at least for a while, simply to do what needs to be done. “This is what I want to do forever,” Benson says. “I know I can find the place I’m supposed to be. When Cole Sweet’s parents first urged him to try dance lessons at age 8, he wasn’t keen. But once he signed up for hip-hop and acrobatic classes at the Oakville dance studio his older sisters frequented, he was hooked. A year later, Cole started ballet — it turned out to be “pretty fun” — and he hasn’t stopped. He’s not the only one who loves the intensity. A growing number of boys are slipping on dance shoes. 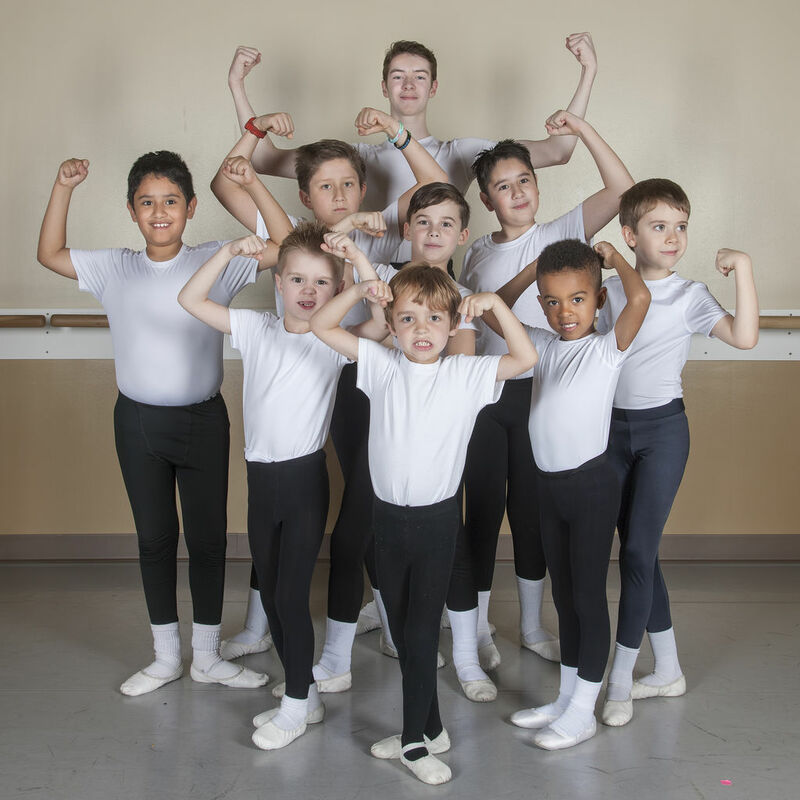 This year, Canada’s National Ballet School (NBS) has the highest percentage of boys in its entry-level Grade 6 class in its history: 65 per cent. Currently, there are 6 girls and 11 boys, including Cole. The school also has the largest enrolment of boys in its 54-year history, with 59 boys in Grades 6 to 12, or 41 per cent. By comparison, when the Toronto school opened in 1959, all 27 full-time students were female; of the 202 after-school students, only nine were boys. Over the last 20 years, the percentage of full-time boys has fluctuated between 23 and 34 per cent. There are likely many reasons for the recent spike in interest among boys, says Laurel Toto, junior school manager. Toto, along with other experts, point to a greater social acceptance of boys in dance; the popularity of dance shows such as So You Think You Can Dance and Dancing With the Stars; the so-called Billy Elliot effect; and the realization that ballet, with all its jumping and turning, is intensely athletic, which appeals to many young boys. The phenomenon isn’t confined to NBS. According to the Australian Bureau of Statistics, dance was the 10th most popular “sport” for boys aged 5 to 14 in 2012, with participation rates rising in recent years. Often, says Toto, boys don’t initially seek out dance. Many, like Cole, become interested because a sister is taking dance lessons and they see how much fun it is. Typically, boys start out in other dance forms, such as tap or jazz, and only later discover ballet. Many will take up ballet because they want to participate in dance competitions, which require them to demonstrate various styles. Also this summer, the Rolling Stones’ Mick Jagger, 70, told Q Magazine that ballet helps keep him in shape. Popular TV shows and films are making all dance forms, including ballet, accessible to the general public, says Norma Sue Fisher-Stitt, professor of dance at York University. “Boys, their parents and their teachers are seeing more examples of young men in dance,” says Fisher-Stitt. 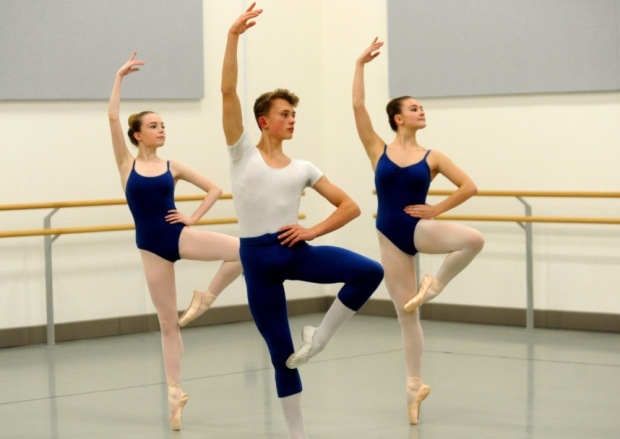 Boys and young men may initially be attracted to other dance forms, but realize to go further they need more training, which may include ballet, she says. “For all dancers in this day and age, the wider your dance vocabulary, the more opportunities you have in the professional environment,” says Fisher-Stitt. When it comes to school, Cole says he’s focused on trying to “survive.” After graduating, he hopes to become a principal dancer in a company. And if that dream doesn’t take flight, he wants to make and test video games. The NBS national audition tour starts Nov. 4 in Moncton, NB, and ends in Toronto on Feb. 9. © Copyright 2013 Toronto Star Newspapers Ltd. In a small dance studio in the Mexican town of Cholula, about a dozen young dancers are being put through their paces under the eyes of their watchful teacher. But while it is hard enough for any ballerina to make a decent living from ballet in Mexico, these dancers face an even greater challenge: they are men. It takes a certain bravery to wear a leotard to work in Cholula, where machismo is still rife. “I have three brothers and they would always mock and bully me about ballet,” says Faustino Rios, 26, one of the most accomplished dancers in the Antoinette Dance Company. But now they’re my biggest fans!” he says proudly. Mexico’s most famous male ballet dancer – Isaac Hernandez, a soloist at the Dutch Ballet Company – says he was lucky because dance ran in his family. “Both my parents were ballet dancers,” he tells me during a rare trip to his native Guadalajara. But my father had to leave Mexico when he was very young – he went to the United States when he was 17. “He didn’t want that to happen to us, so when he offered ballet as an option to me and my siblings, he gave us 100% support,” Isaac recalls. But according to Miguel Calderon, a footballer turned dancer for the Antoinette Dance Company, that kind of acceptance and support is still not the norm in Mexico. Now a teacher of dance as well as practising it himself, he recalls how a group of boys came into one of his classes and started making jokes about ballet. “I told them: ‘I was a football player too, but I bet you can’t handle an hour and a half of one of my ballet classes’. Well, they accepted the challenge and now I have 11 boys learning ballet!” Miguel says. Someone who has done more than most to break down the ingrained ideas about traditional male roles in Cholula is the boys’ instructor, Ivonne Robles Gil. Over the years, she has trained around 50 young men in classical dance, even providing those from low-income families with grants so they can afford to study. She says that change, even though gradual, is well under way. “Mexico has improved a great deal in terms of ballet,” she explains as her dancers warm down after a strenuous session. “Now you find many more male dancers, including some who have achieved national and international acclaim. This has opened the minds of people in society, but also the minds of boys who might have wanted to dance but were fearful of being judged for being dancers,” she says. And it is not just the young boys who are making great leaps in Mexican ballet. On the other side of Cholula, inside a stuffy dance studio, adult dance teachers have gathered for a masterclass in Benesh Movement Notation, a system similar to a musical score which can document any form of dance. The teachers come from all over Mexico, urban centres as well as rural areas. Watching over them is the doyenne of ballet in Mexico, Julieta Navarro. The Mexico director of the Royal Academy of Dance for more than 25 years, she says the current boom in ballet is irreversible. “When I started my job, there was just a very small group of teachers, mainly in Mexico City. But the academy has been training new teachers and that has given us the opportunity to have more schools and more students,” she explains. She confesses she does not know what lies behind the speed of ballet’s expansion in Mexico over recent years. But she says its popularity among boys can be partly attributed to a hugely popular film on the subject. In Cholula – where some of the dancers still keep their passion for ballet secret from their friends and relatives – the British film has been an inspiration. The story of a boy whose family bans him from dancing only to be won over and see him take the lead in Swan Lake has allowed many of the male dancers to dream of achieving a similar feat. [United Kingdom] – A survey found dancing was the third most popular career choice of boys aged between two and 12 – just behind doctor in first place and footballers in second. 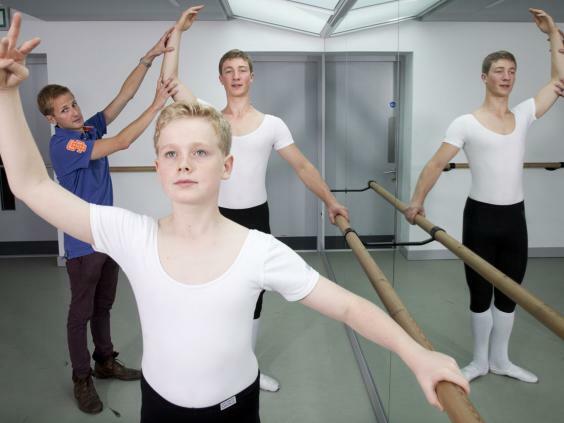 More boys – 8 per cent – want to be dancers than girls – 5 per cent. Some 7 per cent of girls would rather be a footballer than pursue a more traditional female career, such as a nursing. The research by Mothercare and Save the Children shows the impression left on the kids of today by the success of dance troupes such as Diversity, which sprang to fame on Britain’s Got Talent. Diversity leader, choreographer Ashley Banjo, has since launched his own series on Sky and street dance schools are popping up in towns across the UK. The survey’s surprising results come more than a decade after hit film Billy Elliot challenged stereotypes about boy dancers with the story about an 11 year-old who takes up ballet during the coal miners strike. Doctor is the dream profession of both girls and boys. For girls, teacher is second best, but 7 per cent want to be a footballer.